Asus has unveiled its latest ZenWatch model, following two watches that have tried to be a little different in the original ZenWatch and ZenWatch 2. It's perhaps a little worrying, then, that the latest ZenWatch doesn't so much strive to be different, preferring to step towards the mainstay of Android Wear devices out there. We got the chance to see the Asus ZenWatch 3 soon after the reveal at IFA 2016 in Berlin. The smartwatch script is now becoming rather familiar. Crafted from luxury materials, designed to exhibit craftsmanship and suit all styles, in all situations, the result is that the ZenWatch 3 isn't so much a statement of individuality, but the latest in a line of round Android Wear devices. Measuring 45mm in diameter, the ZenWatch 3 is a large device, but that's in part necessitated by the 1.39-inch display that sits within it. Whether you think it's too big or not comes down to personal taste: for those of us who wear a larger watch, the size is perfectly acceptable. The shift to a round device will find favour with those who found the previous rectangular model a little too formal. The ZenWatch 3 adds chunk, at about 10mm thick, a more masculine design, although the pairing of light leather with the rose gold model might be slightly more effeminate than the silver and gunmetal (pictured) alternatives. The overall build feels solid enough once it's on the wrist, although the weight feels a little on the light side. It takes you a little by surprise as it looks like it should have more heft. These things are important in the world of watches, where many associate heft with substance. That said, the Tag Heuer Connected is very light, so the ZenWatch is in good company. The biggest point of differentiation, however, falls into two camps. Firstly, this is the first Android Wear device to feature three buttons and that adds interest and adds a sort of chronograph chic to the affair. The second point of differentiation is the lugs. These hold the strap in place, offering the same quick releases sliding tab that Asus has used before for easy removal of straps. But the top detailing of the lugs strikes us as a little too finicky. The cut in next to the bezel narrows them before they expand to accommodate the width of the strap. It's more exciting than the straight lines of the Moto 360 watches and more practically executed than the overly extended lugs of the LG Watch Urbane. The major win for Asus is in the feel of the rear. Where some devices have felt too cheap on the wrist, the ZenWatch has a more sophisticated feel where it touches skin. It also offers IP67 water protection, so it won't mind the odd splash. Packed into the heart of this stainless steel wearable is a Qualcomm Snapdragon 2100 chipset. This is one of a new breed of smartwatches with a core that's designed with wearables in mind – and more power efficient than the Snapdragon 400 of previous generation devices. There's 512GB of RAM and 4GB of internal storage, which makes for a picture that's pretty typical. We didn't have the chance to fully test the ZenWatch in our brief hands-on period, but we'd expect the performance to match that of other devices of its ilk. As we mentioned, there's a 1.39-inch 400 x 400 pixel resolution AMOLED display on the front. This looked as though it offered vibrant colours, with plenty of detail on this small window into your world. The display is topped with Gorilla Glass 3 for protection. The ZenWatch 3 is packed with the sensors you expect, and Bluetooth and Wi-Fi and the whole thing is powered by a 340mAh battery. It's not the highest capacity out there, but there's an extended battery option, which gives at 40 per cent boost if you clip it on the back. We didn't see the optional battery pack, and we have no idea about the practicality of wearing this extra battery at the same time as the watch. What is more appealing is Asus' HyperCharge offering. This will charge the battery to 60 per cent in just 15 minutes, via the charger that magnetically snaps to the back. Smartwatches have all so far struggled to deliver a healthy battery life, but at least Asus looks to be doing something about that. Just as Android Wear device design is becoming a little uniform, so too is the experience. Although Android is accepting of adaption and change, the experience of living with an AW watch is pretty similar. Asus has tried to tackle this slightly stale position with the inclusion of a programmable button. This can be set to launch your app of choice, so you can always get to your most important app on your wrist. Another area that Asus wants to make a difference is in customisation. There are six themes and 50 custom watch faces. You can even design your own watch face using the accompanying smartphone app. That said, there's no shortage of watch faces available on Google Play, if you're struggling to find something you like. Perhaps the strangest offering is a full ZenFit suite. This fitness app wants to assist you on your activities, but we can't say that a metal watch and leather strap really suits physical exercise. As much as Asus wants to jump on the fitness bandwagon, there is no heart rate sensor and there is no GPS. We can't say we'll really miss that, but at the same time, we'll likely leave our fitness tracking to a specialised device. That said, Asus has stated that the measurements you get from the ZenWatch 3 are 95 per cent accurate. The Asus ZenWatch 3 is a welcome addition to the Android Wear portfolio and for the €229 asking price, you get a pretty good quality device with reasonable looks and hopefully performance that will keep other devices at bay. There's only so much you can tell about a smartwatch from a brief period of time with it, but first impressions are pretty good. 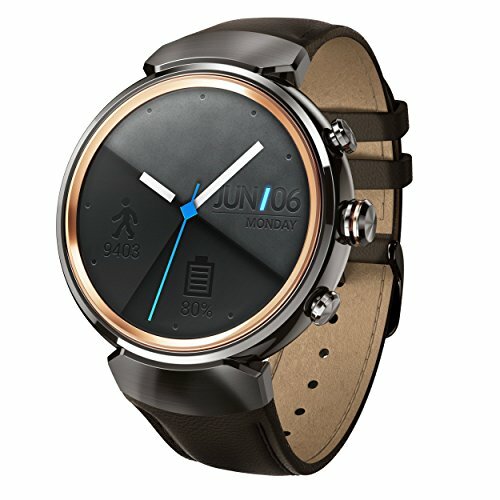 There haven't been many smartwatch launches in 2016, so if you're looking for something up to date, the Asus might be your smartwatch of choice. There's no word on when the ZenWatch 3 will be available, but we'll be sure to bring you a full review as soon as we can.